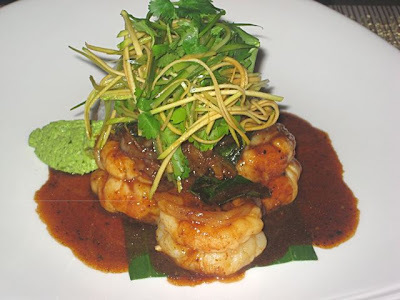 I had originally planned to do a post today about Noodles restaurant at the Hotel Yasmin. But I deleted the photos by mistake. I still feel I should say something. In summary, let me put it this way. Their menu (not in English) offered noodle dishes from around the world, but it seems their favorites spices were salt and sugar. The Phad Thai (229 CZK) was sweet as candy. The Yaki Udon (239 CZK) and ravioli with black olive sauce (169 CZK) both needed a trip to a desalination plant. When a restaurant cooks German, Italian, Chinese, Korean, Mexican, Swiss, and Indonesian food -- beware. In almost every case, they are a jack of all trades, master of none. But in this case, I'd even say they don't know jack. And now I turn to more pleasant duties: writing about a place that does know how to use spices. We returned to the restaurant Angel in Old Town. It was a year ago that I wrote a post about our first visit. In the case of this restaurant, the favored seasonings are lime leaf, cilantro (coriander), coconut, and curry. All of which I love. The interior of the one-room restaurant hadn't changed and I still found it quite attractive. I recycled the decor photos from our earlier trip. 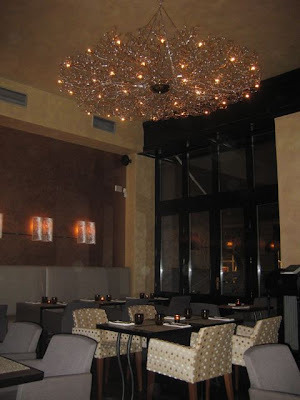 It has warm beige tones and cool lighting fixtures. Not a bad place for a date. I was glad to see they were doing some business, despite the bad weather. Many nearby restaurants were empty. Their good and unique bread was the same as last time. There were two warm balls of regular and two of cheese bread. The salted butter was a bit too cold and hard, but the heat of the bread melted it soon enough. On the menu, the starters all sounded great. We couldn't decide which two to choose. Luckily, there is a taster platter for two (525 CZK). 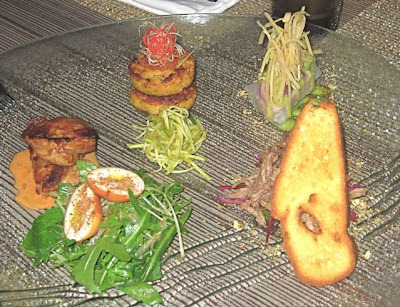 It included seared tuna roll, duck rillettes, quail breasts, and fish cakes. The tuna was our favorite. The fresh red fish barely touched a hot pan and was then placed with basil leaf in a cool rice paper roll. It came with peanut and green chili nahm jim and homemade pickled ginger. The ginger was similar to what you'd get at a sushi restaurant, except that it was made inhouse and was fresher and better. The pan-fried quail was fresh and perfectly prepared. It was marinated in soy and ginger with pomelo. On the side was an Earl Grey-infused quail egg and fresh red chili sauce. I wished the marinade and chili sauce underneath were more assertive. The sugar and spice cured duck had the largest portion. The flavor was quite complex. I thought I detected some anise but couldn't put my finger on all the flavors. There was a plum sauce, a five-spice brioche crispbread, and red chard leaves in palm vinaigrette. A tasty little salad. The two small fish cakes were made from Balinese lilit-spiced red snapper. There was a lemongrass and shallot sambal. They came with a green mango in coconut and lime dressing. They were dense and a little chewy. I liked them, but I'd rank the others on the plate as better. I talked V into ordering the prawns, which I wanted to try (525 CZK). She thanked me afterward. They came with a sweet soy glaze. V was neutral about the sauce, but said they were the best prawns in recent memory. Very large, perfectly butterflied and cooked. There was a cucumber and coriander salad on top. I agreed they were excellent. 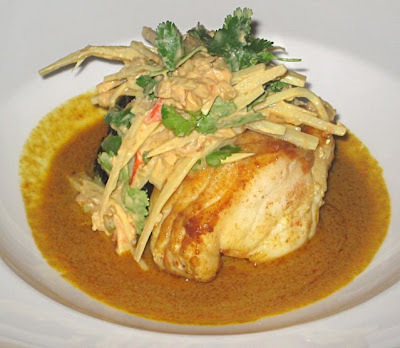 I had the Thai-style orange curry of monkfish (550 CZK). It came with with black rice and bamboo shoot and cilantro salad. I tried a bite of the spongy monkfish and curry by itself. I didn't think it was too exciting. But I enjoyed it much more when I mixed the flavors of the warm fish with the cool salad on the fork. 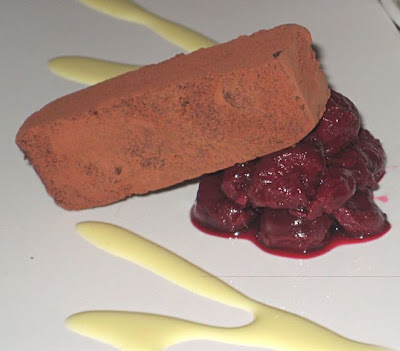 For dessert, I had the Valrhona dark chocolate marquise with sour cherry chutney and lemon and thyme anglaise (175 CZK). This was a very smooth, intense little piece of chocolate. They cherries were quite sour, which was good for cutting through the sweetness of the dessert. 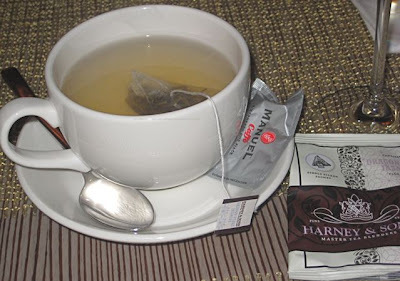 V had a cup of Harney & Sons tea (60 CZK). It was a lovely jasmine. A .33 liter bottle of mineral water was 45 CZK. A Beefeater gin and tonic was 115 CZK. Stella Artois non-alcoholic beer was 55 CZK. 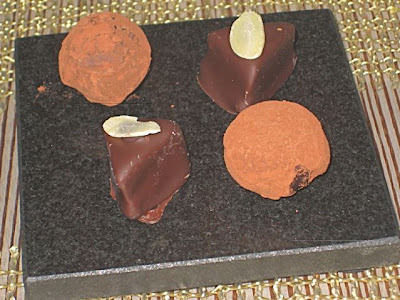 After we asked for the bill, we received more complimentary chocolates. The ones with almond on top tasted strongly of marzipan. If I had remembered this tradition at this restaurant, I might have skipped dessert. I wasn't drinking that night, so that helped keep the cost to 2095 CZK, plus tip. I like Angel a lot. I haven't found anything else quite like it in Prague -- the pan-Asian menu, the complexity of the dishes, and the attention to detail on the plate. It's not cheap, but you can pay a lot more for a lot less fun at dinner. Couldn't agree with this post more. I HATE Noodles - people have dragged me there for work lunch on multiple occasions. And I have always hated it. The only redeeming quality is they have a great outdoor seating area in the summer. But it doesn't make up for the food. The last time i went I said I would never go back. It is my least favorite restaurant in Prague. 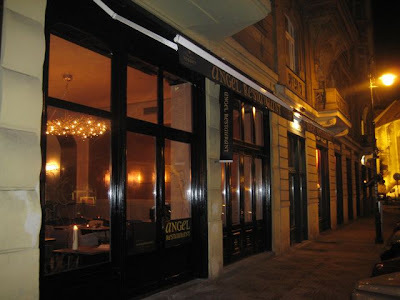 And my favorite restaurant in Prague is... ANGEL! Great food, great experience. My wife and I loved it and plan to go back again soon. The only place we like nearly as much is Cafe de Paris. We went there (again) last night and it was as fantastic as usual. 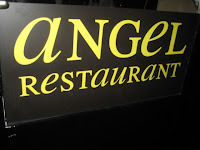 It is about half the price of Angel and much closer to our apartment - so it is our restaurant of choice. "When a restaurant cooks German, Italian, Chinese, Korean, Mexican, Swiss, and Indonesian food -- beware." FYI, Yaki-Udon is a Japanese word & dish. I do occasionally screw up and appreciate corrections, but in this case, I was aware Yaki-Udon is Japanese. The menu has a number of other national dishes, including Czech. I just didn't see the need to take the time and space to list them all (including Japanese). Perhaps I wrongly assumed everyone knew where Yaki-Udon was from. Thanks for watching my back. Also agree with you on Noodles. The first time I was there it was bad, tho the next time it was just ok. Hope to try Angel tonight for H's bday, but she's already been there, so we'll see. Sad to say, but took J to Angel for Valentine's day and we came away slightly unimpressed. Service and atmosphere: A+. Simply excellent. The starter platter: A-. Fantastic shredded duck and the most tender quail breast I have ever eaten. Tuna spring rolls were great. The quail eggs were fine, but could have done with something more tasty to complement them. But there was something that looked like shredded crabsticks that basically tasted of nothing. So we waited in eager anticipation for the main course. I had the Chinese style slow-roast pork belly. 50% fat at a guess, and it should be crispy but just wasn't. I've had this in China several times and was sadly disappointed by the Angel version. J had the lamb from the Valentine's Special menu. It was jaw-achingly tough and looked grey around the edges which was a bit worrying. The waiter went to talk to the chef and explained that this was the effect of the yoghourt marinade which made sense. We decided to skip desert, which may have been a mistake, but after asking to have a chat with Sofia from the word go (we know her from her special menu nights at Oliva and have chatted to her a few times) and being assured that she was in the kitchen, cooking, we were informed that she had left because it had been a long day. Hmmmm. So. Maybe we hit it on a bad day, and I would definitely go back for the shredded duck, the quail breasts and to try the sea bass (they had run out), but I can't help but feel a tad disappointed by the whole main course experience. Sorry to hear that, Will. Two restaurant books I've read in the last 6 months, Kitchen "Confidential" and "Waiter Rant", both say eating out on Valentines Day, especially if there is a "special" menu, is not a good idea. that starter you ordered, the taster for 2, did you each get a plate of 4 tasters? or was it 1 plate shared between you both? It was one plate shared between the two of us.